Despite the early start for the gig (as always Rock City has a club night on Friday nights so gigs have a 10pm curfew instead of the usual 11pm), plenty of fans were queuing outside before the doors opened, so by the time opening act Western Sand hit the stage, there was already a good crowd to enjoy them. The band have recently released their ‘Cut You Down To Size’ EP, and if like me you haven't heard it, judging by their set tonight it's definitely going to be well worth a listen. It's a classic hard rock sound and they put in a great rock set that certainly seemed to go down very well with the fans. Definitely a band well worth a listen. My only criticism would be that the songs all had a similar pace, so there wasnt much variation during the set - I thought it needed a nice slow song mid set to break things up a bit, but that's just my opinion, and plenty of fans seemed to enjoy the set as it was. Next it was time for Michael Schenker's Temple of Rock. 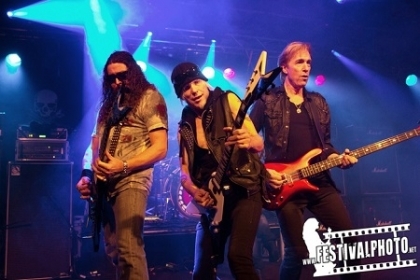 Michael Schenker's name alone is enough to know you're in for a good gig, but when you see who else is on stage with him then things get even better. On vocals he has Doogie White, a man who has sung with bands including Rainbow, La Paz, Yngwie Malmsteen and Praying mantis. On drums he has former Scorpions rummer Herman Rarebell. On bass it's another former Scorpions member, Francis Buchholz, and the lineup is completed by Wayne Findlay on guitar and keyboards. So that's three former Scorpions on stage..
What makes this tour even better is the fact that Michael Schenker is in probably the best form of his life. In the past he's always been a superb guitar player, but has always seemed reserved on stage, often lurking at the back of the stage shunning the limelight, but now he seems to have far more confidence and actually looks to be having a great time on stage. Rather than hiding away at the back of the stage, he spends a lot of time right at the very front edge of the stage getting as close as possible to the crowd, and looking amazingly happy. Tonight's show kicks off with the UFO classic, "Doctor doctor" - what a great way to kick off a gig and the fans were loving things right from the start. It's the first of several UFO songs to be played tonight, alongside songs from The Scorpions, Michael Schenker Group (MSG) and songs from his Temple of Rock project. Really tonight's set could be described as a greatest hits set spanning his career so far, given how many top quality songs we get. From there on it's ninety minutes of perfection from the whole band - all the musicians play superbly, Doogie sings superbly, and all put on a great show and look to be having a great time as they move through a selection of top quality songs. Michael Schenker is a guitarist who really is a joy to watch and listen to/. Alongside all the classic hits and songs from the two Temple of Rock albums, we got some new material. "Vigilante man" was introduced as coming from the band's next album which is due for release in March 2015, and if this song is typical of what we can expect from the album then I for one can't wait to hear it. It was an excellent hard and heavy song. If you're a rock fan then I recommend that you try and get to one of the remaining dates on the UK tour. See the list of dates at the bottom of this review.